The pipe hitch has a variety of uses, but it really comes in handy to help pull out those pioneering stakes that were driven in deeply to maximize the holding power of the anchors. Using the pipe hitch for this purpose can eliminate a good deal of straining, banging, and possible damage when it comes time to take down the structures and disassemble the anchors. You can make a couple of rope grommets out of 12-foot lengths of heavy line that can be set aside and reserved for use with a Pipe Hitch, for easier pioneer-stake-extraction. Note: When stakes are driven in deeply, and especially when the ground is hard, the above technique will be very helpful, but also in conjunction with a process of first loosening the stakes by knocking them on the sides with a mallet. Using a rope to pull a pipe or spar can be difficult because you need all the gripping friction you can get to keep the knot from slipping off as you make the pull. One of the best knots for this type of task is a pipe hitch. Most of the time, the pipe hitch can be tied with four or six turns. If this doesn’t hold, you can always lay on more turns to get the friction you need. Be sure to pull the turns snug as you make them so that you can get the full effect of their friction. 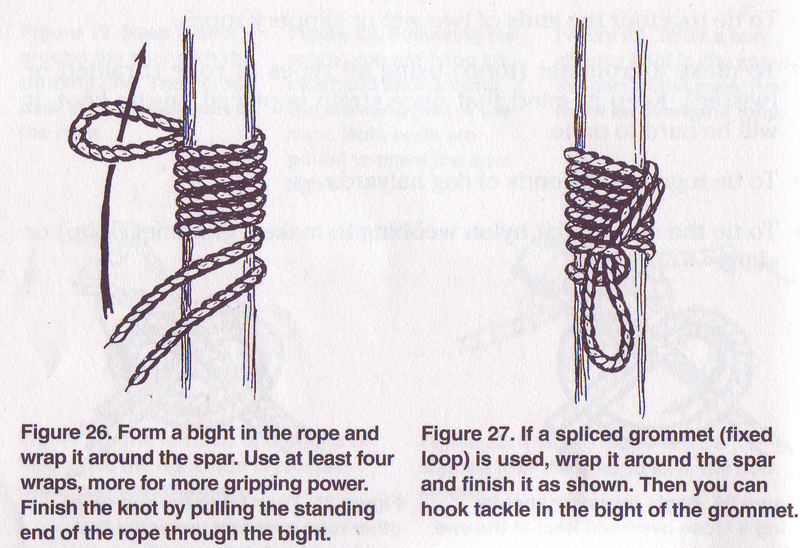 Keep in mind that when you use this knot for a hard pull or for a heavy weight, it should be tied with larger-diameter rope.